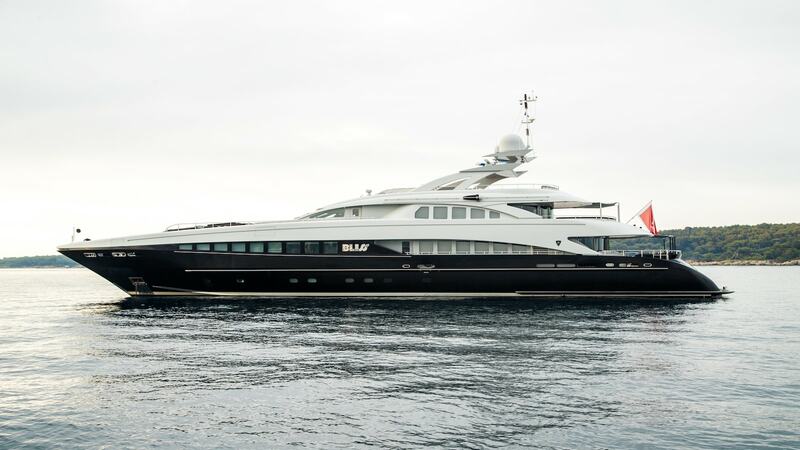 Built by Heesen Yachts in 2007 and refitted in 2019 , Bliss is the definition of a high quality Dutch yacht that combines slick performance and striking sporty lines. With impressive performance credentials, she is able to reach speeds of up to 26 knots, while her modern stabilization system and bow thrusters ensure high levels of comfort when on board. Bliss boasts a contemporary and stylish interior by Icelandic designer Ingibjorg St. Palmadottir with a palette of black, white, silver and dark lavender. She offers generous accommodation for 12 guests in five cabins, making her an ideal choice for charter groups. An elegant main salon forms the heart of the yacht, and is perfect for entertaining, informal gatherings or simply relaxing. A large seating area and entertainment system is completed by a formal dining space, with circular table and leather seating, for enjoying sumptuous meals prepared by Bliss’ talented chef. The yacht’s second central guest space, the upper lounge, is home to a beautiful bar and comfortable seating area. Guest spaces are linked by an impressive lit mirrored spiral staircase that is one of the yacht’s most beautiful design features. Outdoor spaces are extensive, and include a large aft deck with exterior dining and seating, sunpads and a sunken seating area forward, and an upper deck with a Jacuzzi and sauna. Guests will be able to relax in style while enjoying wide views across the ocean and impeccable service levels from Bliss’ passionate and experienced crew. Fun on the water is ensured with an extensive list of water toys to choose from, including towables, SUPs, jet skis, diving equipment and more.